From the American Libraries Magazine; 5/1/2017. Meredith Powers, young adult librarian at Brooklyn (N.Y.) Public Library (BPL) teaches workshops on digital literacy and data privacy as part of the Data Privacy Project, which is funded by the Institute of Museum and Library Services and the Knight Foundation’s Prototype Fund. Password security is always a hot topic. She says that Diceware is an easy way to teach patrons how to create better passwords for their library, service, and email accounts. 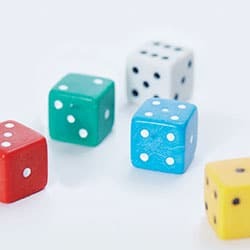 By rolling an ordinary die, users create a five-digit number that corresponds to a word in a Diceware word list. The Electronic Frontier Foundation (EFF) maintains multiple Diceware word lists. If you have seen the SCLS PC order form recently you may have noticed the addition of Solid State Drives (SSD) to the list of options available for you to choose. Previously we’ve only offered traditional Hard Disk Drives (HDD), but now you have the option to get either one. What is a Solid State Drive and what’s the difference between the old and new technologies? I’m glad you asked! A SSD and HDD perform the exact same function in a PC or laptop; they store system files and your data. A HDD uses spinning metal platters to perform this function while the SSD utilizes flash memory chips to store data. The advantage of using a SSD is that it accesses the data much faster than a HDD. A typical patron PC using a HDD with MyPC and DeepFreeze installed on it takes roughly 2 minutes from when a patron logs out to when the next patron can log in. The same PC with a SSD takes about 30 to 40 seconds before the next patron can sign in, from what I’ve seen it’s closer to the 30 seconds, I’m just hedging my bet. The disadvantage of the SSD is that it costs more than the HDD per gigabyte. Since SSDs cost more the typical size of a SSD is between 128 and 256GB whereas the HDD is between 256 and 500GB. These sizes are based on the systems we currently purchase. If you look in the consumer market you will see HDDs in the 500 GB to 2 TB range for the same price as the 128 to 256 GB SSDs. To learn more about SSDs check out this informative article in PC Mag. 2013 - "On the Topic of Privacy"
2014 - "Choose Privacy Week"
In addition to all of the great resources mentioned in those posts (can we talk about how much I still love the video of an amazing mind reader revealing his gift?! ), I have a new privacy-related resource to share. To help create confident online interactions, San José Public Library (SJPL) developed the Virtual Privacy Lab, a free, encrypted online learning tool for all libraries to share with patrons. The lab includes content that was also professionally translated in Spanish and Vietnamese and a page with information about how the library manages patrons' privacy. For maximum privacy, an SCLS-supported public PC should always be restarted after the patron has finished using it to remove any personal data and browsing history. Do patrons ever come to you and say that they want to save something as a PDF, but they don't know how? Well, let me tell you about a couple of ways that they can do this. If they have a webpage or web-based email that they want to save as a PDF you can have them use the Chrome browser. Once you have the item up in a Chrome browser press Ctrl+P to open the Print dialog. Then click the "Change..." button found to the right of "Destination". Then under the "Local Destinations" section choose the "Save as PDF" option. Then back in the Print dialog click the "Save" button. If they have a picture they can paste it into a Word document. Then click File and then Save As. Then click the drop down box to the right of "Save as Type" and select the PDF option. Then click the "Save" button. These two methods should handle almost all requests to save something as a PDF file. 'Tis the season for...germs in the library! Scrubbing the gunk off of keyboards and mice turns out to be a little different than disinfecting them... and when it comes to disinfecting, would you be surprised if I told you that alcohol doesn't disinfect against everything? Hand sanitizer either! Disinfecting against enterovirurus, norovirus (stomach flu), and influenza (flu) requires some special action. A little Google searching brought me to this excellent FAQ by the New Jersey Department of Health about the respiratory virus Enterovirus-68. It gives recommendations for what WILL work to disinfect surfaces to prevent the spread of enteroviruses (and noroviruses) in the section, "What is the best way to clean surfaces?" But before you douse all your possessions with bleach, there’s one thing you should know: Experts say that you really don’t need to bother. “Honestly, if you’re trying to prevent the flu, there’s just not evidence that spraying everything with disinfectant is going to make any difference,” says Christine Hay, MD, assistant professor at the University of Rochester Medical Center. So...what's the take-away for stopping viruses? Prevention! Focus on handwashing (scrub those nasties away! ), not touching your face with unwashed hands, and trying hard not to spread any viruses you may be carrying (stay home when you're sick, cover your cough and sneeze! ).